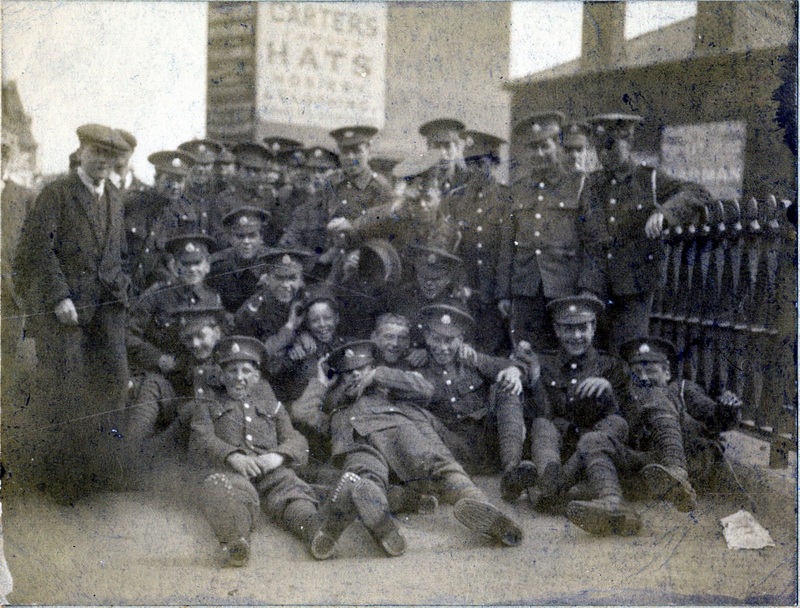 Recruitment of the Wandsworth Battalion had progressed well, in July the Recruiting Committee of Wandsworth Council had produced 15,750 handbills and posters which had been distributed throughout the borough. The proof copy and the finished version are below. This had resulted in over 900 men having signed up by the end of July and by 4th August, when they paraded at the Ram Brewery, there were 1020 men. Not only did the men have to be equipped, but order had to be maintained in a battalion where all the men were local and might be expected to enjoy local amenities. 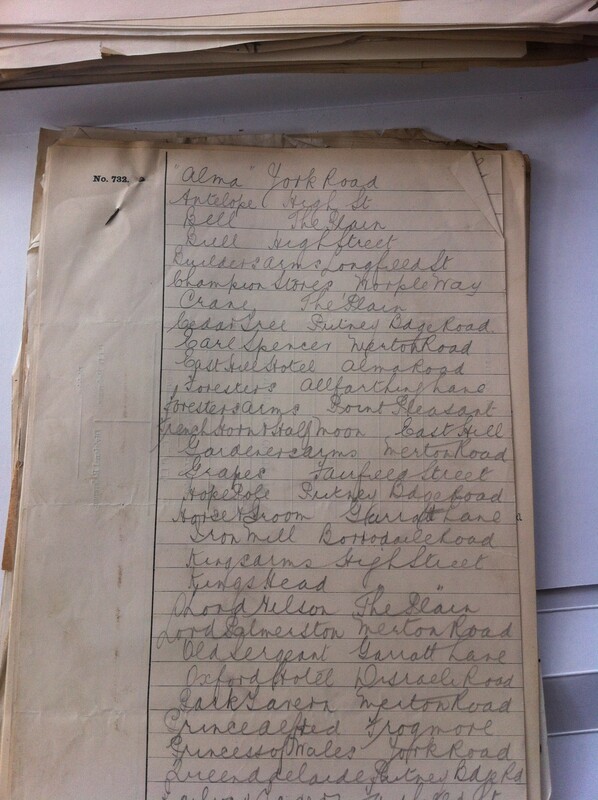 The correspondence file contains a list of the pubs in Wandsworth at the time, attached to a copy of a letter written to all the licence holders from the Adjutant of the Battalion. This reflects the very greatest credit upon the way in which Licence holders in this district have conducted their establishments, and I am further instructed to thank you for the great forethought you have shown in conducting your business, in regards to soldiers, which greatly assists in maintaining the character of your local Regiment. 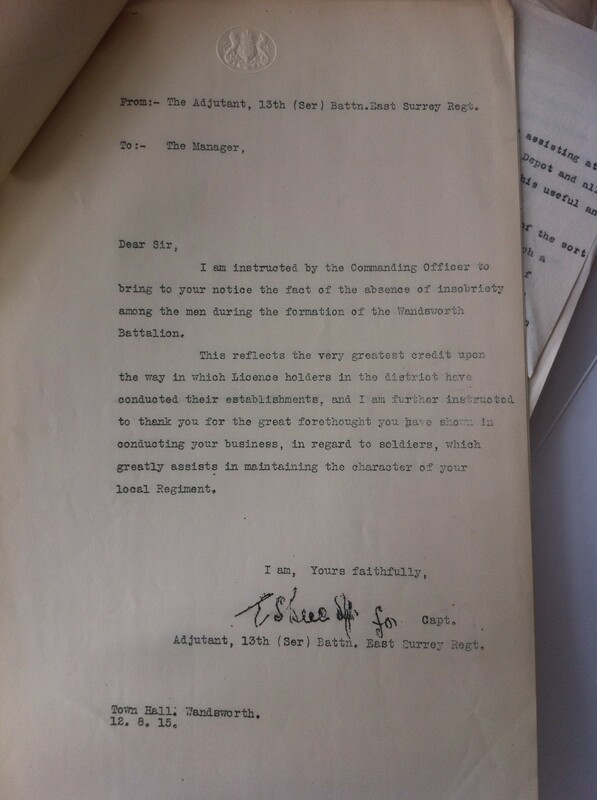 Local pub landlords had perhaps been requested to not allow soldiers to get drunk in order to help keep the battalion popular locally, although no such suggestion is recorded in the minutes or the correspondence. The letter even emphasises that it is their local regiment, presumably to keep them on side and remind them that slightly lower profits could be contributing to the war effort. Both the equipment suggestions and the implied worries over insobriety suggest that raising a battalion in short space of time was no small task. Wandsworth may have been one of the quickest to raise a battalion to full strength, but recruitment was not the only, and perhaps not the hardest, task involved in doing so. The Tooting & Balham Gazette reports this week on the recent meeting of the Tooting Ratepayer’s Association. The meeting started off with some discussion on the increased cost of living, raised by Councillor Cusden (who owned grocery stores, see here for more information), he pointed out that provisions and foodstuffs had risen in price by 20 to 25 per cent but wages had not. The overall feel of the meeting seemed to be that the competition between firms was keeping costs lower and it was the small traders who were doing worst out of the situation. The chief item on the agenda was more controversial, as it was the proposed closing of public houses until the termination of the war. Councillor Hurley, honorary secretary of the association, had placed it on the agenda as it seemed to be a burning issue of the time. Councillor Cusden felt that total prohibition was out of the question. A small section of the community should not be allowed to dictate to everyone else and “a man was a much entitled to have a glass of beer as another man was to have a cup of tea” – he quote a figure that £160 million a year was wasted on drink and expressed the opinion that it was no more wasted than on tobacco, there should not be any more slur on beer than on tea or cocoa. Crime had reduced and the best thing that had happened was the reduction of pubs’ opening hours. The Chairman of the Association – W H Smith (not he newsagent) argued that the Chairman of the Middlesex Sessions had said the drop in crime was remarkable and could only be put down to a reduction in drunkenness, and he claimed that 80% of those in workhouses and infirmaries were there due to drink. If 60,000 people a year died of fever, steps would be taken to stamp it out and as a teetotaller he clearly felt that steps should be taken to reduce the amount of alcohol consumed. Councillor Hurley pointed out that drink problems were decreasing, he had never seen such a sober crowd as that on Easter Monday and only saw one drunk person in Tooting. Mr Edwards, though himself teetotal, felt that the licenses of many of the local public houses were amongst the most respected men in Tooting, and involved in the well-being of the community. In the past, according to Councillor Hurley, the area had been known as “drunken Tooting” which he considered a gross slander. Councillor Cusden said that it was “sober Tooting” today and that those who were drunk were visitors from other areas. A resolution was eventually passed that the Ratepayers Association did not support prohibition but were in favour of the continuation of reduced opening hours. The issue must have been of some concern to the community, as there was a lengthy letter in the paper from an M Arran of Coteford Street relating to “The War and Drink”, which picked up on allegations that drunkenness was impeding the supply of munitions due to the condition of some of the workers. The letter suggests that the Government ought to have foreseen the shortage of munitions and that the workers are not to blame, even if there was a small minority who over-indulged in alcohol. His proposal was that spirits should be prohibited, except for medical purposes and that wine should be duty free as it was of great value. Beer, however, “is a matter requiring much more drastic and revolutionary action”. This action was to take the form of the nation becoming its own brewer, so that a purer beer could be brewed, which could then be available in improved pubs. Those pubs would be “light, airy, comfortably and beautifully appointed, where a man can take his wife and children, where he may drink beer, wine, tea, or anything else he likes…Given these conditions and drunkenness would disappear”. The reduction in pub opening hours had come in under the Defence of the Realm Act, pubs were only allowed to open from noon–2pm and 6:30pm–9:30pm. You can find out more about the reduction in openings hours and the Carlisle experiment of government owned pubs in this National Archives blog post. Balham & Tooting Gazette available on microfilm in the searchroom.